It’s January! Has your inbox become filled with emails that are telling you how to be your best self? Or how to lose some weight? Or how you can fix your life?? Are you just deleting them all because they’re all starting to make you feel…overwhelmed? I generally have avoided trying to make over my life every January and have instead opted to start thinking more about the state and quality of my life. I use January as a time to reflect upon the previous year, not rush into the future. Did I connect with family and friends last year? Did I treat my body right? If I answered no, then I’d think about what small ways I could make changes in my life so that I could improve the overall quality in the coming year. These are no pressure approaches by the way. Being a business owner I have enough deadlines so the thought of adding to that list makes me cringe, so I look at these as fun assignments I will give myself and allow the space to let them happen. I also think of them as ways to incorporate more self-care into the day to day. When I looked at 2018, I realized that while I was building new parts of my business, I wasn’t leaving much time to spend with friends and family. So for 2019, my assignment is to have more casual get-togethers at home. Nothing requiring lots of advanced planning, but an excuse to sit, eat and drink, and enjoy the company of friends and family. And I’ve already planned my first one with a longtime friend I feel like I barely got to see last year. 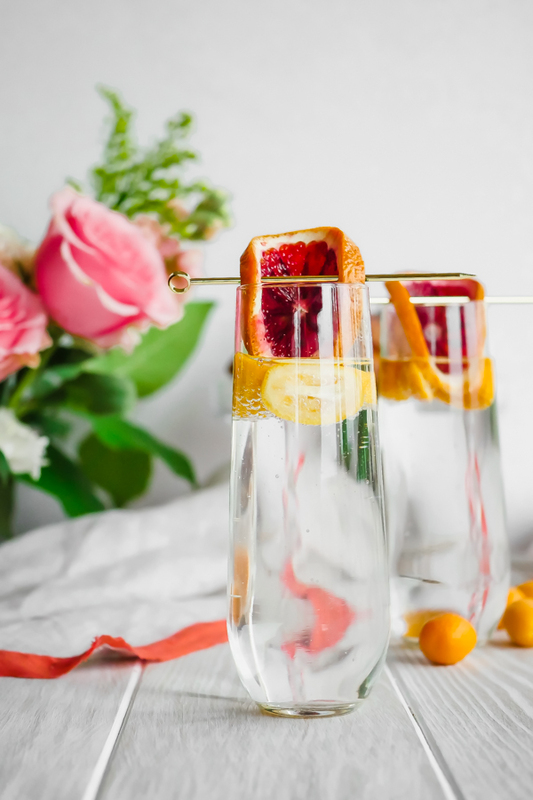 We’re calling it brunch, but really it’s an excuse to eat some pastries, buy some fresh flowers, and have some brunch cocktails. This is my ideal self-care weekend date. 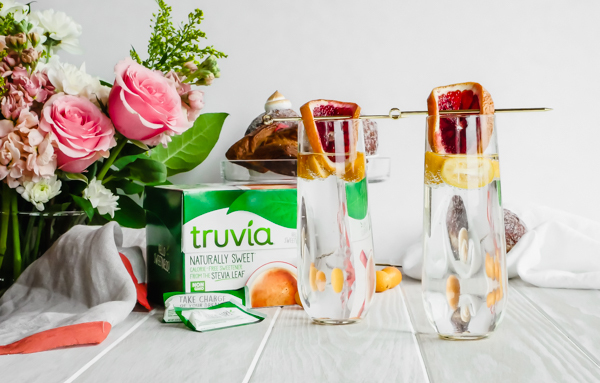 We’ve teamed up with Truvia® to help plan a brunch cocktail for two with their Natural Sweetener packets. 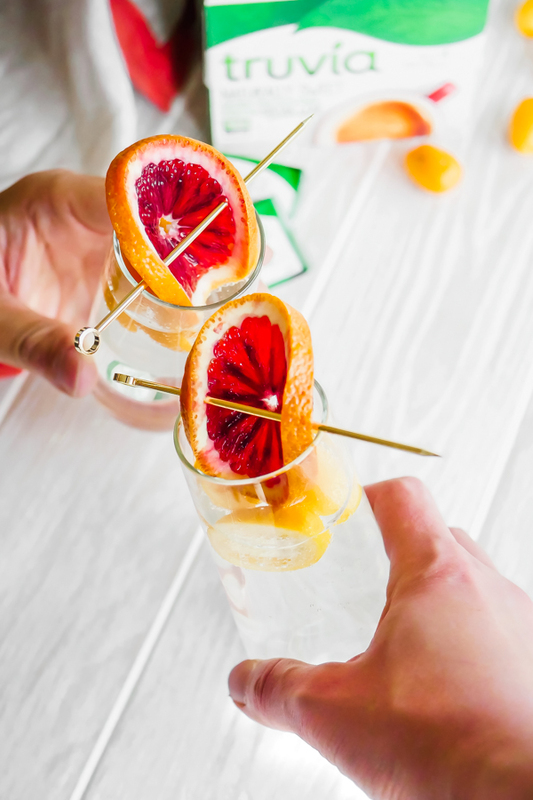 You just need one packet, split between two friends, to get the ideal amount of sweetness in your brunch cocktail (One packet provides the same sweetness as two teaspoons of sugar). 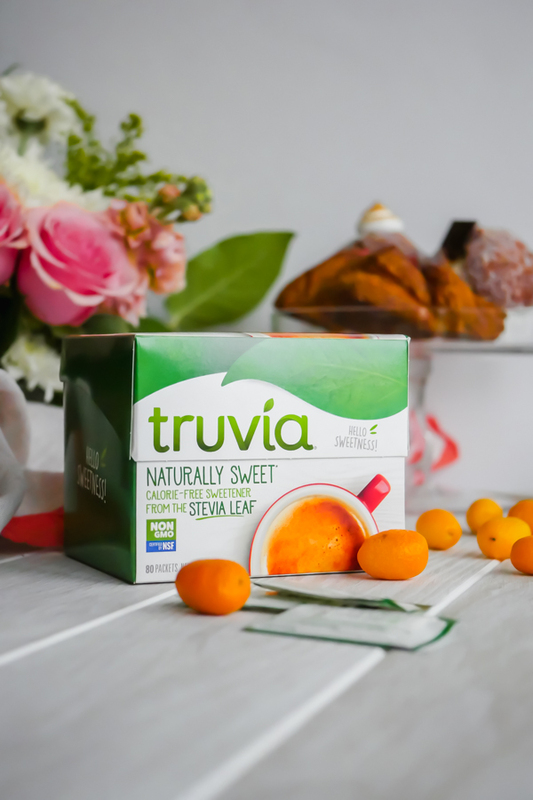 Truvia Natural Sweetener packets are zero-calories and made from stevia leaf extract. 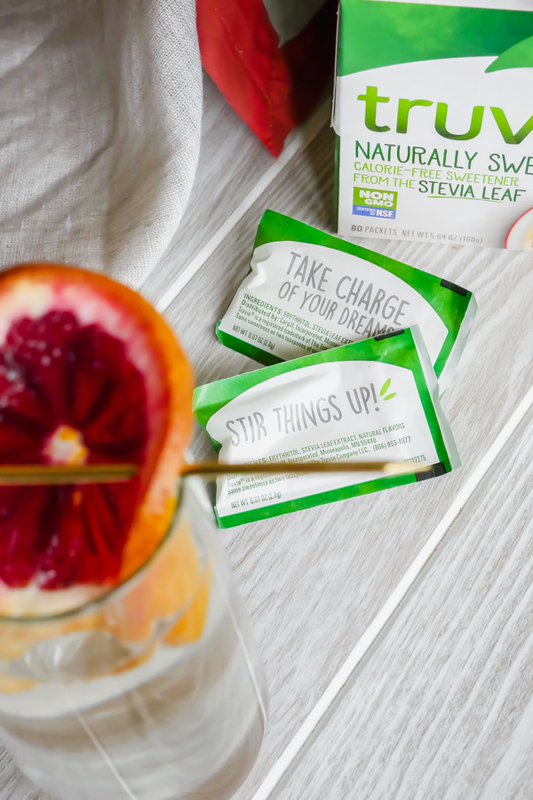 The packets are also convenient to carry around, in case your get-together involves a park or a camping trip (if that’s the way you do casual!). For our cocktail we’ll make use of the delicious, seasonal citrus fruit that is everywhere right now. I’ve always loved how citrus is a winter fruit, bringing a burst of sunshine into all those grey, winter days. 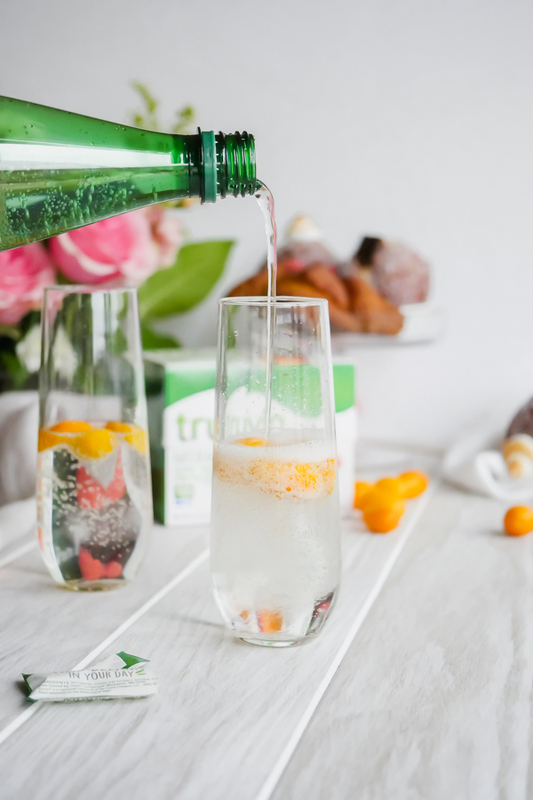 Hopefully this cocktail, made with citrus distilled gin, orange blossom water, lemon bitters, club soda, and Truvia sweetener, will bring a little sunshine into your day. It also goes very well with a pastry plate. In a shaker filled 2/3 with ice, pour in gin, the Truvia Natural Sweetener packet, freshly squeezed orange juice, orange blossom water, and lemon bitters. Shake well for 20 seconds and divide between two flutes. 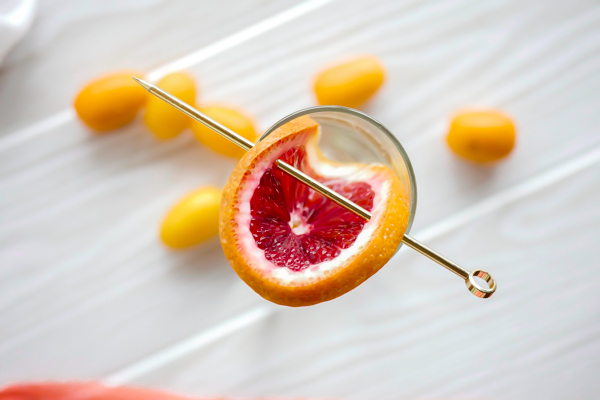 Add in your citrus of choice and top with chilled club soda. Cheers!